Christian Dell was born in Offenbach am Main in Hesse. He completed the silver forging studies at the academy in 1911 and from 1912-13 he studied at the Saxon college of arts and crafts in Weimar. From 1922 to 1925 he worked as a foreman of the metal workshop at the Bauhaus in Weimar where he was the man behind a highly innovative and pioneering style of design. 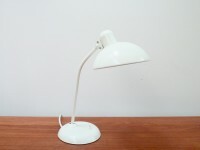 Beginning in 1926 Christian Dell sketched lamps, usually for the lamp factory Gebr. Kaiser & Co in Neheim Hüsten*. 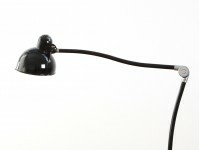 The first catalogue was launched in 1936 in which the table lamp model 6631 Luxus appeared for the first time. This lamp soon became the undisputed top model of the KAISER idell™-series – then, as well as today, the symbol of noble Germanic design, exquisite choice of materials and precise engineering. As an early industrial designer and pioneer of plastic design, he used bakelite and aminoplastics as materials in 1929-30. After World War II, Christian Dell manufactured silver goods and opened a jeweller´s shop in Wiesbaden in 1948, which he operated until 1955. He died in Wiesbaden in 1974. The term “idell” is a reference to the word idea and his lastname, Dell. “Kaiser” is a reference to the original manufacturer – KAISER idell.